High-level trends and intimacy of insight. 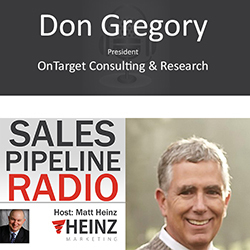 Our guest this episode is Don Gregory, the founder of On-Target Consulting. The importance of gathering market insights, marketing intelligence, doing research to understand what the markets is interested in. About the importance of having those insights at the front of the process to guide and help navigate product development, message development, et cetera. If you are highly confident that you know your customer, you know your marketplace, your competition, emerging trends with your consumers, you can argue that you don’t need to get insight early on in the process of going to market and figuring out how to take products and services to market. The reality is that most companies and most leaders really don’t have that insight. What makes it worse is that many of the companies in my opinion who are providing market research are providing facts and data, they are really not driving to try to understand the consumer, what the consumer is looking for whether it be B2B, B2C, it really does not make any difference, the process is the same. Matt asked, "Why is it so important to make sure you are approaching this research right? Maybe a different way of asking that is what it is sometimes dangerous to have company insiders do their own research?" Don responded with, "Their bias to start with. And they don’t know that many… I do the research completely inside and go out I bring a natural bias to me, with me as I do that investigation. And the rigor has to be impartial and has to be neutral. When I am looking for an answer to a question, I have to have integrity in process and in actions to make sure that I work an honest answer to what I am looking for versus – here is my assumption on what the answer is therefore am going to ask the question to assume and get the answer that I am looking for. And it is subtle because when you are on the inside I don’t think you understand that bias that you carry and that’s why I think the rigor for having somebody or some organization from the outside who has the expertise in looking in at business situations as well as the business savvy to really look and understand sort of what the key questions are. Once you understand what they key questions are, the areas of investigation are, then to effectively find out the answers to those questions." Listen to the full episode to learn more.